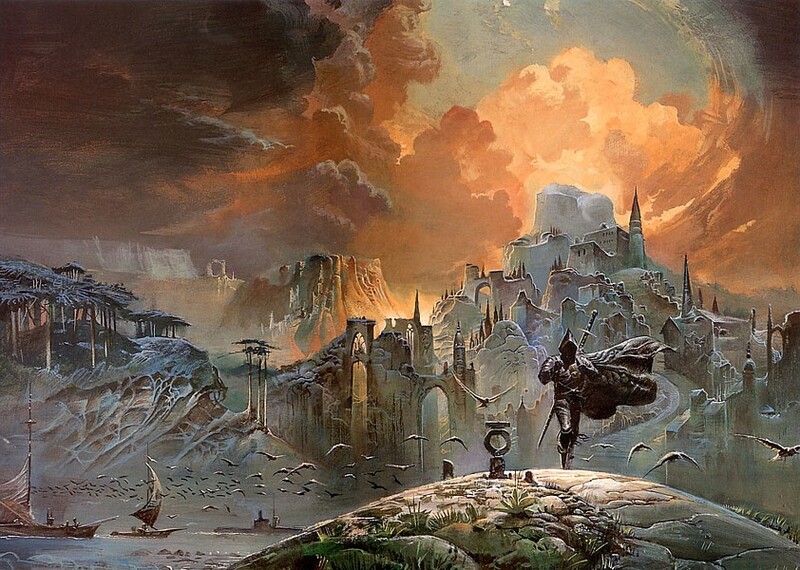 For lovers of science-fiction and fantasy book art from the 1970s and ’80s the name of Bruce Pennington looms large. He is indelibly associated with some of the greatest writers of the era, his baroque images gracing the covers of such diverse publications as Frank Herbert’s “Dune” or Harry Harrison’s ” Stainless Steel Rat”. However for many his most accomplished professional creation is the atmospheric jacket illustration he produced for the first hardback edition of Gene Wolfe’s 1980 novel “The Shadow of the Torturer”. Frequently copied, rarely matched, it remains a textbook example of book art, technically perfect in almost every respect. 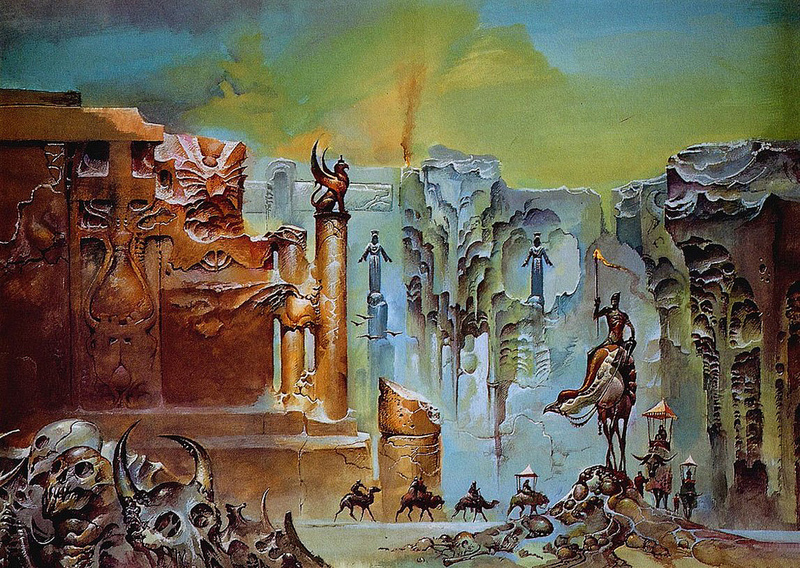 However two more wraparound illustrations for the stories relating to the character of Severian the Torturer as well as his work on the dust jackets of Frank Herbert’s “Dune Messiah” and “Children of Dune” (below) give further proof of his abilities as an artist. Unfortunately I can only find the former in its published form, complete with title and blurb, but it still displays the exquisite nature of Pennington’s art, the use of one dominant colour in variable shades of pastel highlighted by flashes of brighter colour. 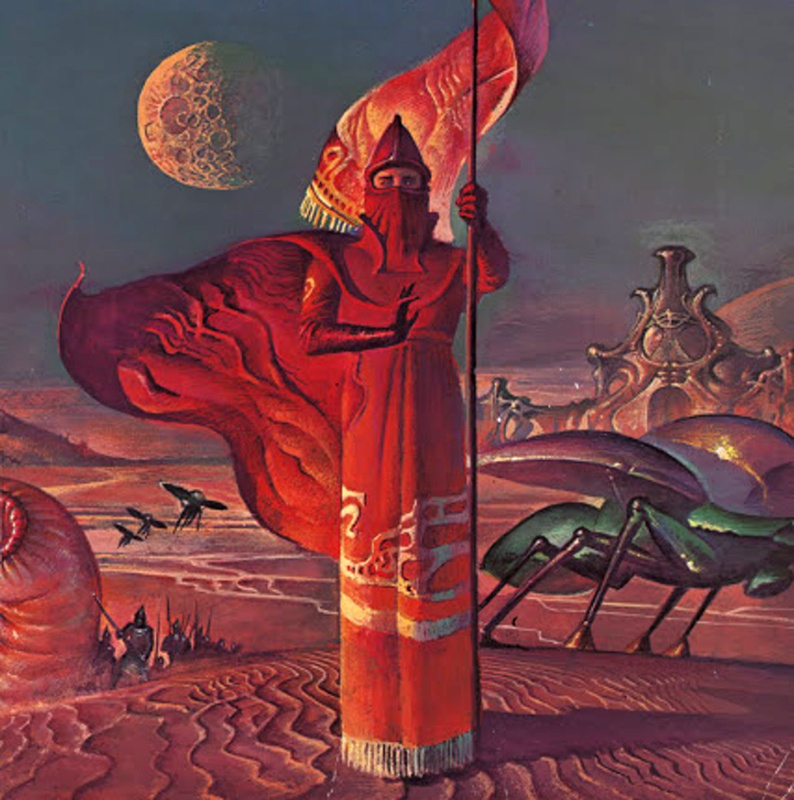 The third painting below is a crop image from another work by Bruce Pennington, the British frontispiece for the cover of the now rarely encountered “Dune Encyclopaedia” edited by Willis E. McNelly with the co-operation of Frank Herbert and published in 1984. 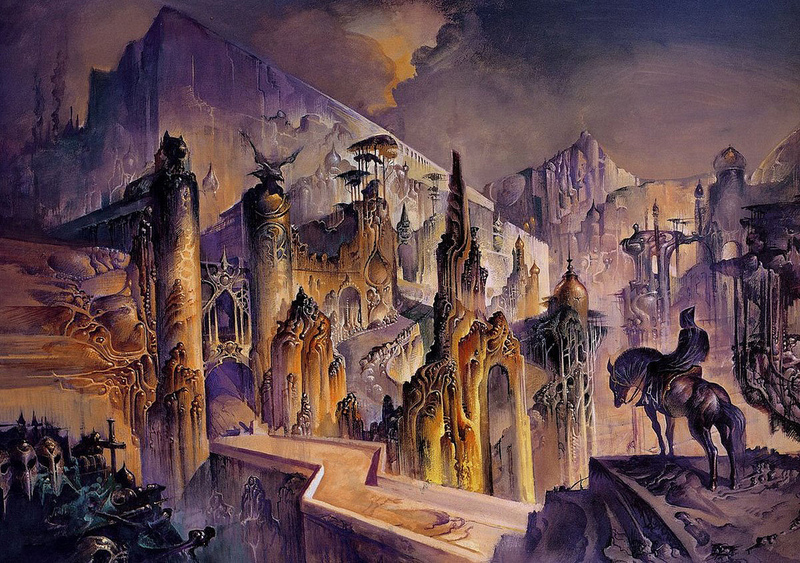 Based upon the latter’s Dune series of novels it has long been out of print due to the notoriously litigious nature of the Herbert estate under his son Brian Herbert, who has penned a series of novels with hireling writer Kevin J. Anderson based upon his father’s works that bear little relation to the “in-universe” materials found in the encyclopaedia. 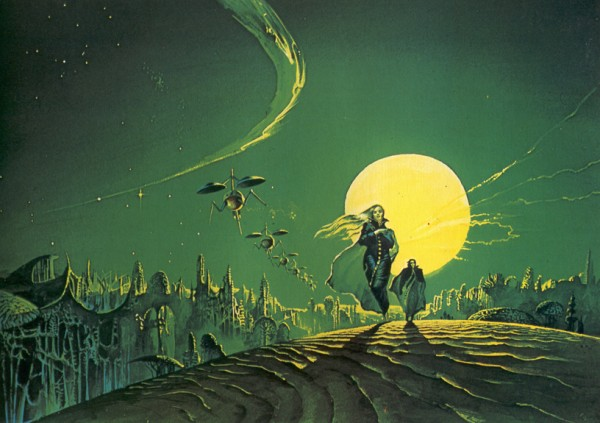 While many regard the information created or compiled by McNelly as “canon” (including in part Frank Herbert who wrote an introduction for the publication) others follow Brian Herbert in discounting its importance. 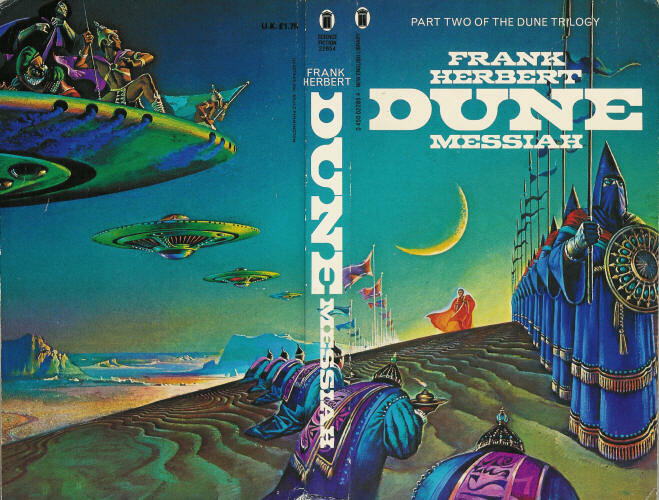 Personally I found the 2000s’ Dune sequels and “prequels” by Herbert junior unreadable and prefer the original works, though admittedly by the time of 1981’s “God Emperor of Dune” Herbert senior had certainly lost his artistic way.